44 MMS December 2016 mmsonline.com BLACKMAN ON TAXES Columnist More than 45 years ago, my firm put together a system designed around the specific goal of reducing estate taxes for our clients. Over the years since, however, this system has evolved from one focused only on cutting those taxes to a more comprehensive plan focused on helping clients keep all of their wealth. Because our system does, in fact, keep all of a person's wealth in his or her family, it automatically eliminates the estate tax. I refer to this as "our" system, because it is built around a network of professionals who are called upon as their expertise is needed: accoun- tants, lawyers, insurance agents and others. Our system guides our clients through a step-by-step plan for keeping ever y dollar of their wealth in their families. 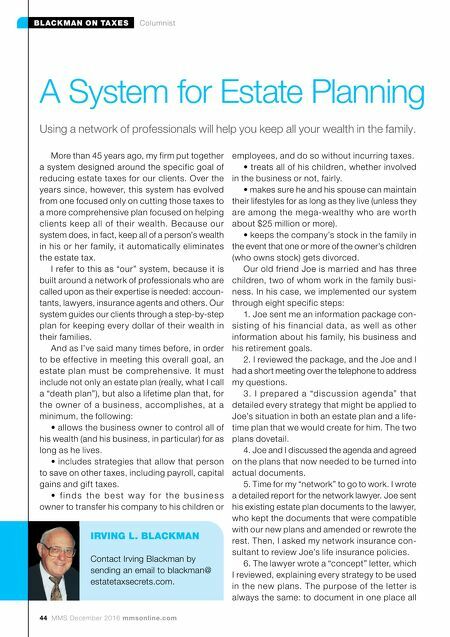 And as I've said many times before, in order to be ef fective in meeting this overall goal, an estate plan must be comprehensive. It must include not only an estate plan (really, what I call a "death plan"), but also a lifetime plan that, for the owner of a business, accomplishes, at a minimum, the following: • allows the business owner to control all of his wealth (and his business, in particular) for as long as he lives. • includes strategies that allow that person to save on other taxes, including payroll, capital gains and gift taxes. • f i n d s t h e b e s t w a y f o r t h e b u s i n e s s owner to transfer his company to his children or employees, and do so without incurring taxes. • treats all of his children, whether involved in the business or not, fairly. • makes sure he and his spouse can maintain their lifestyles for as long as they live (unless they are among the mega-wealthy who are wor th about $25 million or more). • keeps the company's stock in the family in the event that one or more of the owner's children (who owns stock) gets divorced. Our old friend Joe is married and has three children, two of whom work in the family busi- ness. 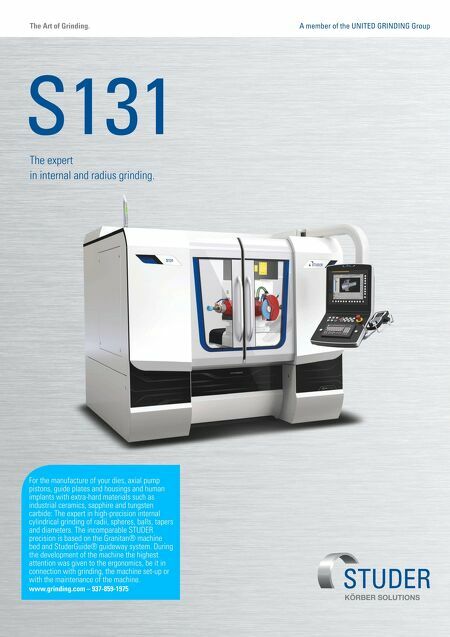 In his case, we implemented our system through eight specific steps: 1. Joe sent me an information package con- sisting of his f inancial data, as well as other information about his family, his business and his retirement goals. 2. I reviewed the package, and the Joe and I had a short meeting over the telephone to address my questions. 3. I pre pa re d a "discu s s io n ag e nd a" th at detailed every strategy that might be applied to Joe's situation in both an estate plan and a life- time plan that we would create for him. The two plans dovetail. 4. Joe and I discussed the agenda and agreed on the plans that now needed to be turned into actual documents. 5. Time for my "network" to go to work. I wrote a detailed report for the network lawyer. Joe sent his existing estate plan documents to the lawyer, who kept the documents that were compatible with our new plans and amended or rewrote the rest. Then, I asked my network insurance con- sultant to review Joe's life insurance policies. 6. The lawyer wrote a "concept" letter, which I reviewed, explaining every strategy to be used in the new plans. The purpose of the letter is always the same: to document in one place all A System for Estate Planning Using a network of professionals will help you keep all your wealth in the family. IRVING L. BLACKMAN Contact Irving Blackman by sending an email to blackman@ estatetaxsecrets.com.